The new album by Grätenkinder will be called Serviervorschlag. To shorten the wait until its release in Fall, the band has released a 3 track EP which will not be available in shops. Either you may get it for free at their concerts or by sending 3 euros to them. You should try one of these possibilities because Die Grätenkinder is a really great alternative noisy pop band. The wobbly organs on the opening title track add unusual charm so rarely seen these days in contemporary indie rock. 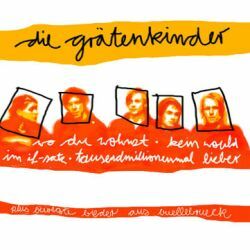 But also the rest of the music is well done as Die Grätenkinder convince with noisy guitars and a solid rhythm section. The German vocals are very simple and direct; you could draw parallels to Boxhamsters and Sportfreunde Stiller. Die Grätenkinder combine pop, indie rock and melodic punk elements in an absolutely natural way which makes it hard to wait for the album in October.